The idea of babies created solely within a laboratory has been fodder for science fiction stories and religious nightmares for years but now, thanks to research coming out of Japan, such children may be one step closer to a reality. 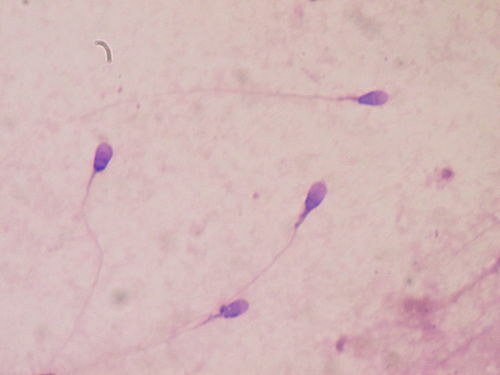 The research team at Yokohama City University was able to successfully develop sperm from fragments of mice testes in their laboratory, which were later used to fertilize eggs from which healthy young were born. The findings could go a long way in providing hope to would-be fathers who have struggled with issues of infertility, provided the results could be reproduced in humans. Success in mice is no guarantee things could be matched in people, according to Dr. Allan Pacey, of the University of Sheffield. He went on to add that, even so, this particular study is an important step to understanding how sperm are formed, and could help lead the scientific community to the ability to routinely grow human sperm in a lab. I imagine this news is going to go a long way in fueling the imagination of writers and movie makers, too. Perhaps we’ll be entering a new era of genetics-themed science fiction very soon. Image by Bobjgalindo, via Wikimedia Commons.